Behind Good and Evil challenges conventional wisdom concerning ethics and morality. It exposes the death-dealing consequences of morality – our knowledge of good and evil – and offers a life-giving alternative. 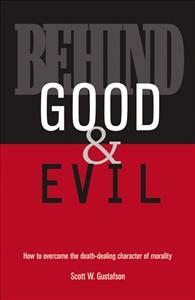 Behind Good and Evil challenges conventional wisdom regarding morality and ethics. It distinguishes between morality and ethics and claims that morality – our knowledge of good and evil – is a death-dealing enterprise. It argues that evils like American slavery, the Holocaust or the near genocide of the American Indian population are not moral malfunctions but are consistent with the principles of morality itself. After exposing the death-dealing consequences of morality, Behind Good and Evil develops a life-giving alternative called ethics. The practice of the ethical virtues and tactics discussed and developed in Behind Good and Evil create life-giving alternatives to morality.